People can sometimes have the misconception that wall murals are always over the top with bright colors and overly saturated tones. While this may be true with some mural designs, a wide range of imagery exists that would be suitable for even the most reserved gentleman. Take for instance the wall mural in the inspiration room above. The mountains in their neutral tones are accented by the lines of green pine trees; the waterfall creating the perfect focal point just above the bed. 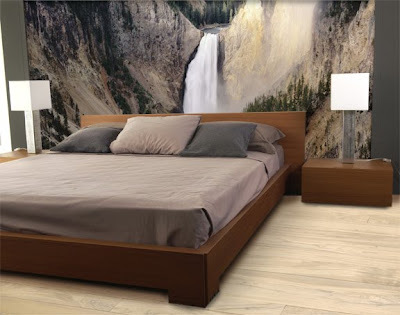 A great example of how custom wallpaper may be used as a creative and non-traditional headboard. i love this! i design custom fabric, so i know what that passion is like. i've always wanted to design my own line of wallpaper as well. love your blog!